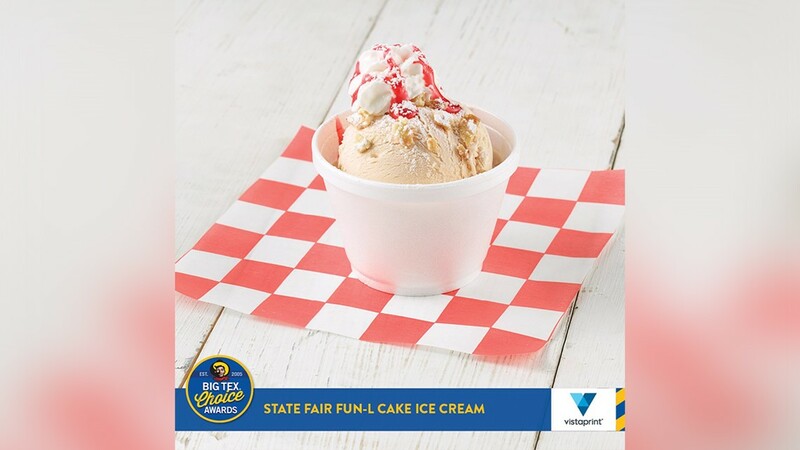 State Fair of Texas officials announced the finalists for the 14th annual Big Tex Choice Awards and they're looking pretty delicious already. 44 more days until we can all sink our teeth into the new creations. Sweet or savory, there's something for everyone...especially if deep fried everything is your cup of tea. 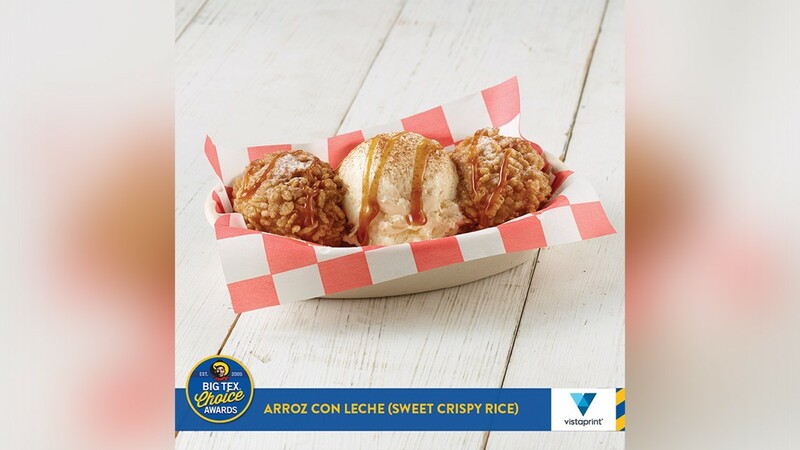 Arroz con Leche (Sweet Crispy Rice) from the Garza family: A delectable cinnamon-spiced rice ball is formed, battered, and coated in crispy puffed rice cereal. The ball is then deep fried to golden perfection. This scrumptious indulgence is sprinkled with powdered vanilla and complimented with a Texas-sized scoop of vanilla ice cream. To serve, a mouthwatering drizzle of caramel sauce and powdered cinnamon crowns each tasty treat. 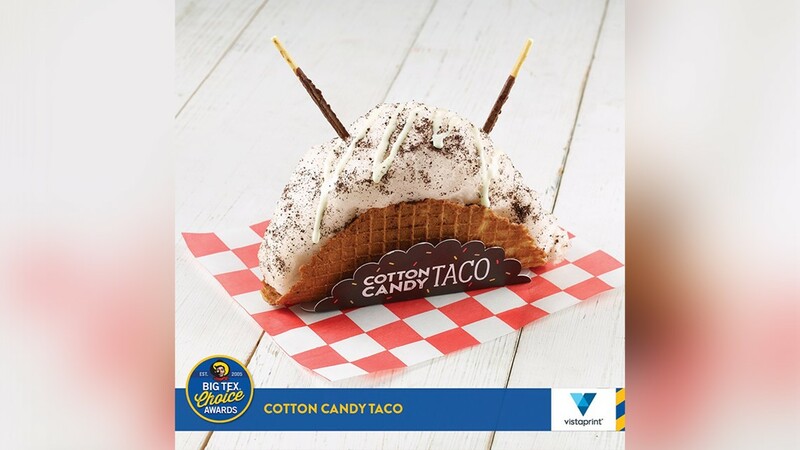 Cotton Candy Taco from Justin and Rudy Martinez: This sweet s'more creation begins with a graham cracker waffle cone batter that is freshly-pressed into a crunchy taco shell shape. The inside of the shell is coated with a marshmallow glaze, then stuffed with chocolate, toasted marshmallow, and organic cane sugar cotton candy. We then top off this handful of sweetness with chocolate cookie crumbles and two chocolate cream-covered biscuit sticks with marshmallows. 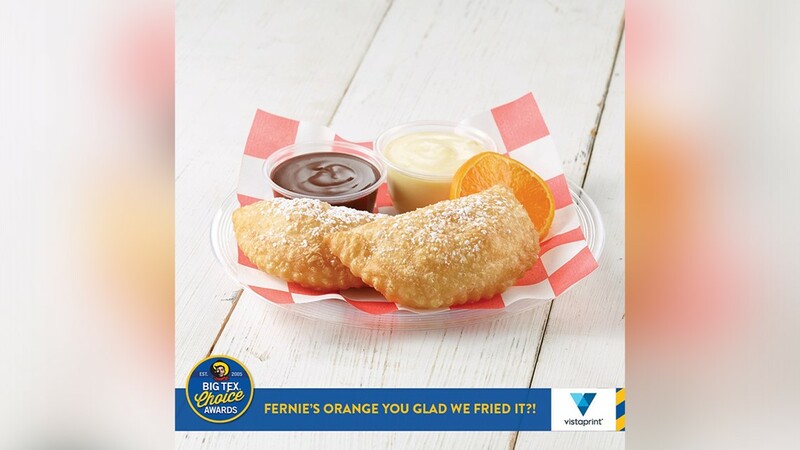 Fernie's Orange You Glad We Fried It (Orange Chiffon Cake) from Winter Family Concessions: One bite and you will be THRILLED! Layers of moist chiffon orange cake, dairy-fresh whipped cream, and citrusy orange preserves are lightly blended to form a refreshing custard-like filling. The mixture is spooned into flaky puff pastry dough, folded turnover style, and sealed with a pastry crimper. The pastry is quickly fried into little crescent-shaped pillows of citrus bliss and then lightly dusted with powdered sugar. Each dish is served with two sublime dipping sauces and garnished with a double citrus twist slice. Fun L-Cake Ice Cream from Tom Landis: We capture the essence and flavor of a funnel cake and combine it with the creamy smoothness of ice cream. Created by Howdy Homemade, this super premium ice cream has funnel cake flavor infused into it with funnel cake pieces and powdered sugar mixed throughout, and on top of, the dish. It is available with powdered sugar, whipped cream, and strawberry sauce. Try to settle for just one scoop! 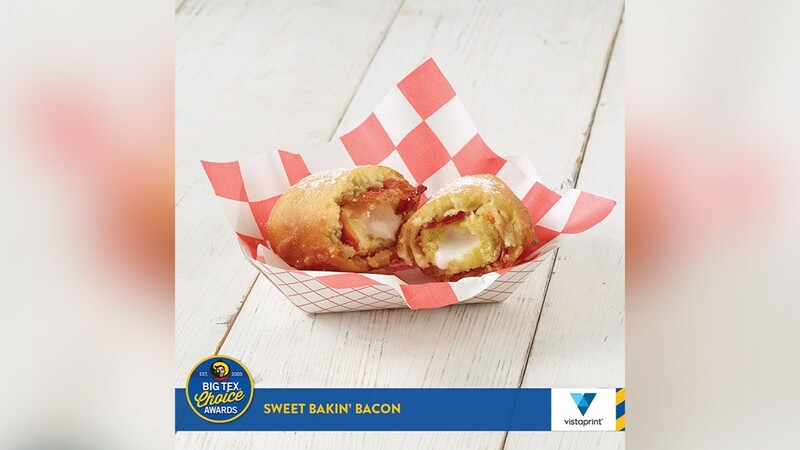 Sweet Bakin' Bacon from Ed and Eddie Campbell: A cream-filled sponge cake is wrapped in savory bacon and then dipped in a funnel cake batter. The treat is deep fried until golden brown and dusted with powdered sugar to finish. 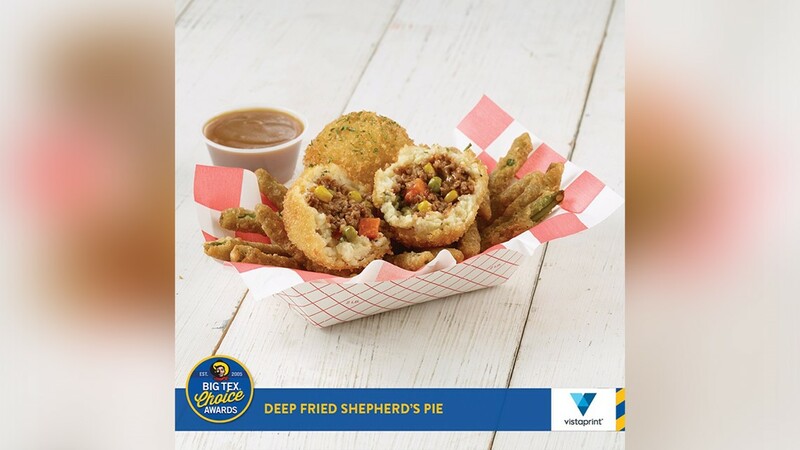 Deep Fried Shepherd's Pie from Clint Probst: We mix shredded cheddar cheese and cream into our savory mashed potato pillows. Each potato ball is filled with Grandma's shepherd's pie filling made of ground beef, mixed vegetables, and rich beef gravy. Our special seasoning creates an explosion of flavors and textures as the filling and creamy potatoes mix with each bite. 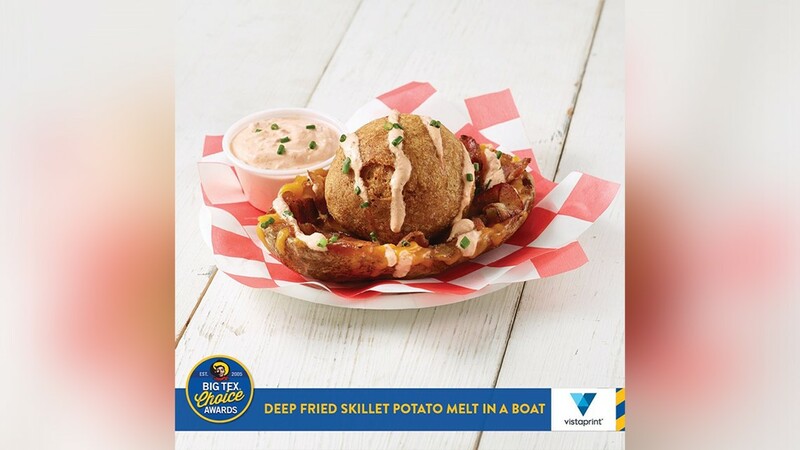 Deep Fried Skillet Potato Melt in a Boat from Tom Grace: This is a tater tot on steroids! We start with buttery skillet potatoes griddled golden brown. We then add diced, griddled breakfast sausage patties and pack the tasty potato mixture around a mini Babybel® cheese loaf! It then gets a quick roll in our special seasoned flour and goes into the fryer. In just a few minutes, you have a wonderful crunch that finishes in the smooth melt of cheese! The deep-fried skillet potato melts are served up in the potato skins they came from and topped with melted cheddar and crispy bacon bites. A sour cream chipotle sauce is drizzled across the top and served on the side for dipping! 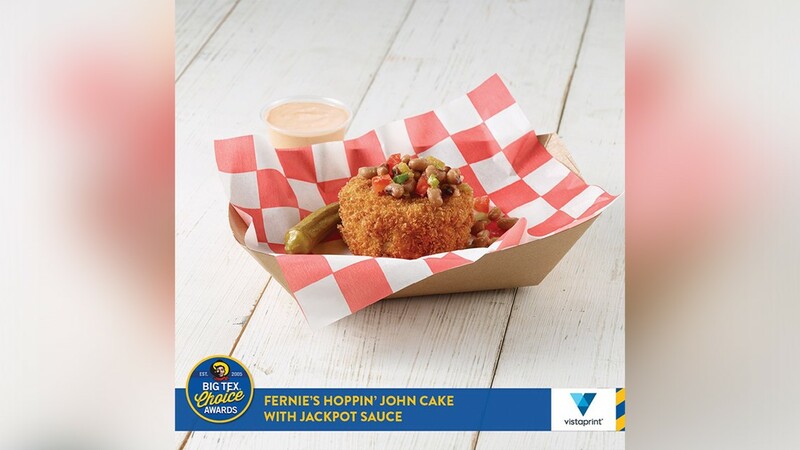 Fernie's Hoppin John Cake with Jackpot Sauce from Winter Family Concessions: This iconic New Year’s Eve southern “good luck” dish takes a dip in the deep fryer for a unique and mouthwatering spin! The classic ingredients of creamy, nutty black-eyed peas, fluffy white rice, spicy smoked sausage, aromatic green onions, and a secret blend of special spices are combined with bread crumbs and eggbeaters and formed into a generous Texas-sized cake. This rich and savory cake is breaded in an egg wash that includes flour and panko bread crumbs. It is then deep fried to a super crunchy exterior and soul satisfying interior. The Texas-sized cake is topped with a zingy black-eyed pea relish, garnished with pickled okra to complete the southern deliciousness, and served with a side of Jackpot Sauce. 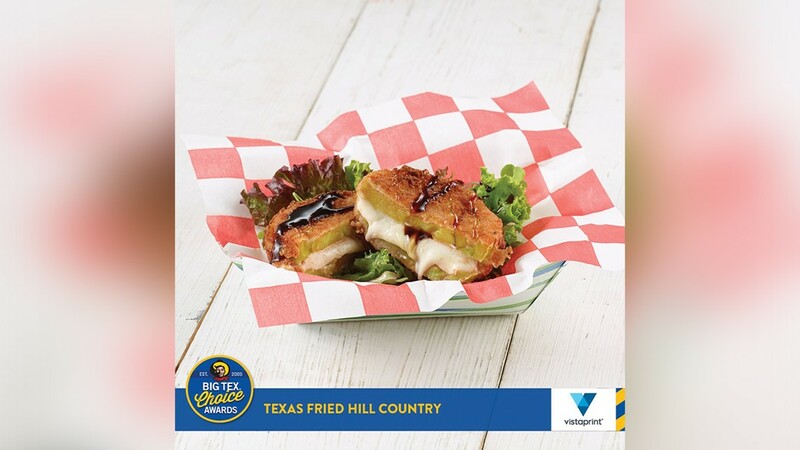 Texas Fried Hill Country from Justin and Rudy Martinez: Texas Fried Hill Country is the best of everything that would come out of the Hill Country in Central Texas. Fried mozzarella is complimented with locally-grown basil, sandwiched between two slices of juicy green tomatoes, and hand-breaded with seasoned breadcrumbs and flash fried to gooey perfection. Each dish is served on a bed of field greens, finished with balsamic drizzle and sweet local Texas honey. 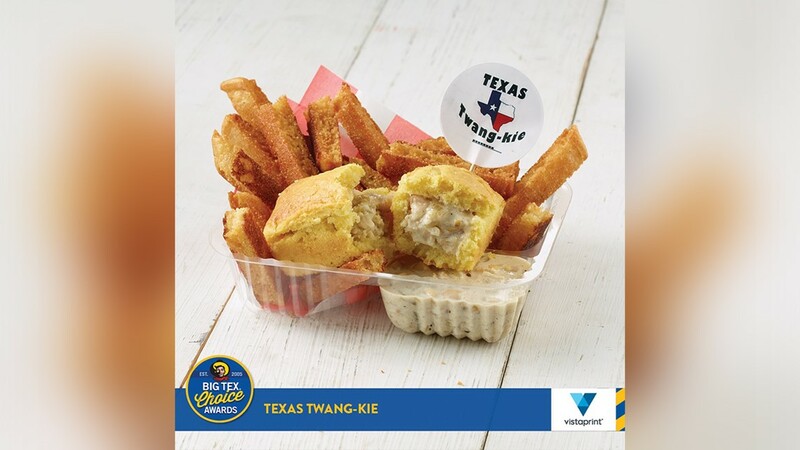 Texas Twang-kie from Chris and Sherry Howard: A savory twist on an American classic! It ain't sweet, but it's perfect. This cornbread cake is baked to moist perfection, hollowed out, and filled with a culinary masterpiece of Tex-Mex grilled chicken white bean chili! Each twang-kie is served with cornbread fries and more chili for dipping. If you want to be one of the first people to taste the food before fairgoers, get your tickets for the 14th annual Big Tex Choice Awards on Sunday, August 26 at 2:00 p.m. in the historic Tower Building at Fair Park. Tickets are available online at BigTex.com/tickets for $125, with a limited number of seats available.